A simple-to-use audio input module is all that’s needed to add music or paging to your sound masking system. The LogiSon® Acoustic Network is also a versatile paging and music system—simply install an Audio Input Module in the Network Control Panel and connect a source, such as a telephone or MP3 player. Area by area, use masking only, paging and music only or a combination—all within a single system. Audio Input Modules offer analog to digital conversion and automatically adjust for input sensitivity. 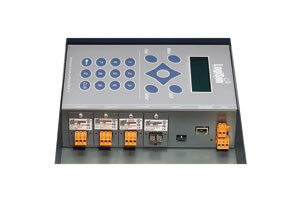 Each panel accepts any combination of three inputs: auxiliary, microphone and telephone. The LogiSon Acoustic Network also features a Priority Page Override, which can be programmed to mute the masking during emergencies. When a priority signal is relayed to the panel, it sets the volume to a pre-programmed level and plays the announcement over the entire system. The administrator can set the masking to either continue to run or to mute during this page. Once the priority page is complete, the system returns to its original settings. The paging and music functions play over the same set of loudspeakers as the sound masking, but zoning and settings are independent—so you can configure the system exactly as needed. Plus the amplification and equalization technology is already integrated into the hubs, reducing the cost, energy and space typically needed for audio equipment. Whereas most systems limit paging to a small number of predefined zones, the LogiSon® Acoustic Network’s zoning is digital, not hardwired. Users can create customized zones whenever and wherever required using Page Director software. Changes can be made within minutes.